Can I see a show of hands from anyone who is surprised by this? It is reported today that the state of Alaska plans to sue the federal government in an attempt to block the Department of Interior from listing the polar bear under the Endangered Species Act. Republican governor Sarah Palin said that the polar bear does not need additional protections and listing the bear as endangered will slow development in the state. When Department of Interior Secretary Dirk Kempthorne announced the decision last week, he made it clear that he didn’t intend on letting it get in the way of oil and gas development, giving a press statement last week fraught with loopholes designed to avoid full enforcement of the law. healthy population (of polar bears) based on uncertain climate models”. Climate models that predict continued loss of sea ice, the main habitat of polar bears, during summers are unreliable. Siegel said it was unconscionable for Palin to ignore overwhelming evidence of global warming’s threat to sea ice, the polar bear’s habitat. In the meantime, several environmental groups including Siegel’s Center for Biological Diversity, Greenpeace, and the Natural Resources Defense Council (NRDC) have started legal action against the Bush administration challenging the “special rules” or “4(d) rule” attached to the Department of Interior’s ruling that reduce the protections normally required of such a listing (think of Bush and his “signing statements” allowing him to ignore laws he doesn’t like). Its incredible when 800 polar bears are shot per year and you literally want to tax AIR! 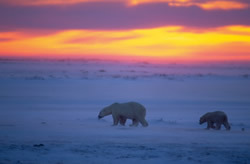 Did you know that in the Hudson Bay area the populations that are increasing are warmer than before and the populations where polar bears are decreasing are cooler than before! If you are really worried about the polar bears prohibit hunting! 1) What is this notion of “taxing air”? Could you explain that? 3) Okay, prohibit polar bear hunting. This post doesn’t address hunting, so it’s difficult to see where you infer any position here on that issue.